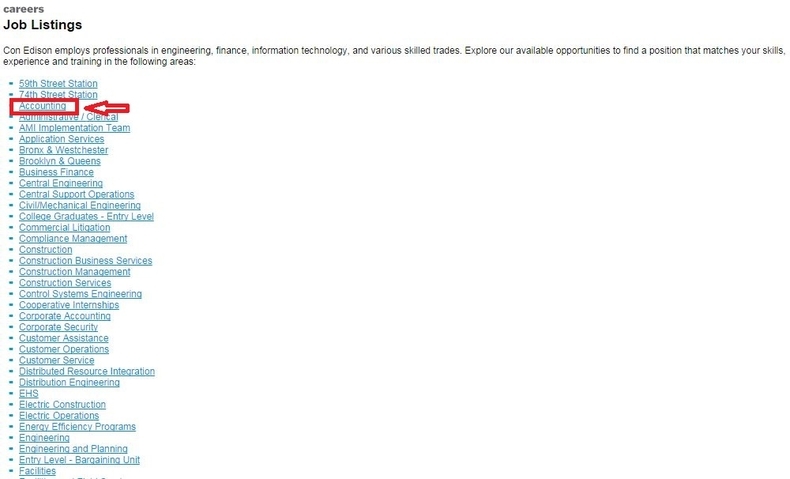 Go to coned.com/careers and land on to Con Edison careers page. You can know more about the careers at Con Edison on its careers page. Current job opportunities are available in four types and you can click one of the link to search opportunities in the type that best fits you. Here we choose the first type - Full Time Professionals and Skills Trades. View all the available areas and select an area for you to start your job search. Con Edison employs professionals in different areas. You can select an area and explore available opportunities to find a position that matches your skills, experience and training. 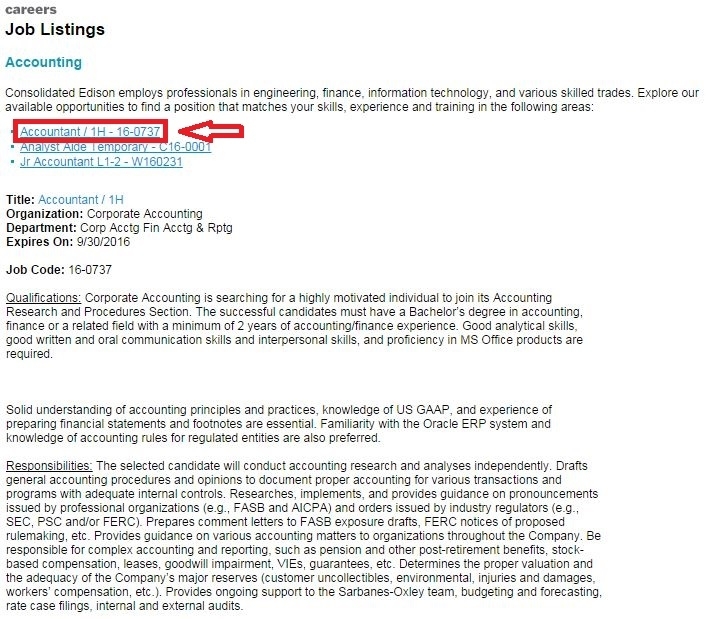 Here we select Accounting Area as an example. Scroll your mouse or click the listed job titles to view the details of the position, such as qualifications, responsibilities etc. and decide which position you are going to apply for. Once you decide, just click the link "Click to Apply" at the bottom of each position to start your job application. Here we choose the first position on the list to apply for. Login with your account or register as a new user. Enter your email address and password to login. If you are applying for the first time, click the "First time" link to create an account for you. Follow instructions to answer the given questions like "Are you 18 years of age or older?" and then click the Next button to continue. Fill out your personal information like name, SSN, address etc. and click the Next button to continue. Please notice that the fields marked with asterisk are required. Indicate your education level, information about your school and then provide information regarding your licenses and employment history. You need to finish all the required fields on each page and click the button "Next" to move on. Follow instructions to finish the rest steps regarding your military service, self-identification, veteran status, disability status and references etc. You need to complete all the required fields in each step, and then click the Next button at the bottom of the page to proceed. Please use Command-V to paste the content of your resume and then submit your application by clicking the button "Submit" at the bottom of the page. 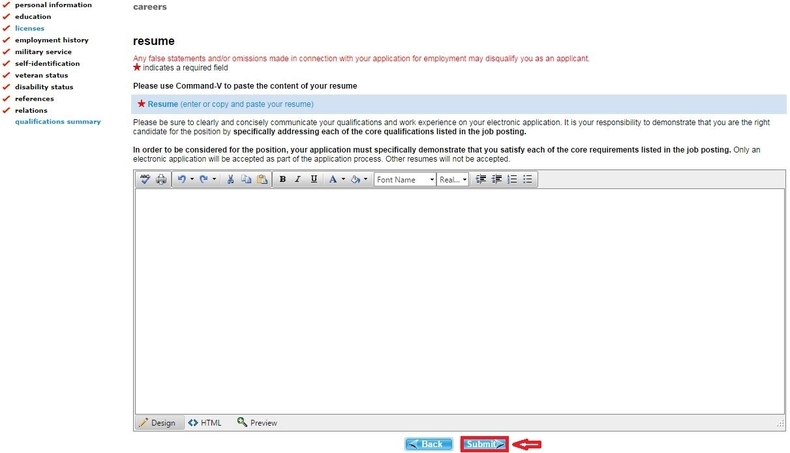 After clicking "Submit", you will be directed into a page where you can see a notification which indicates you have successfully submitted an employment application. 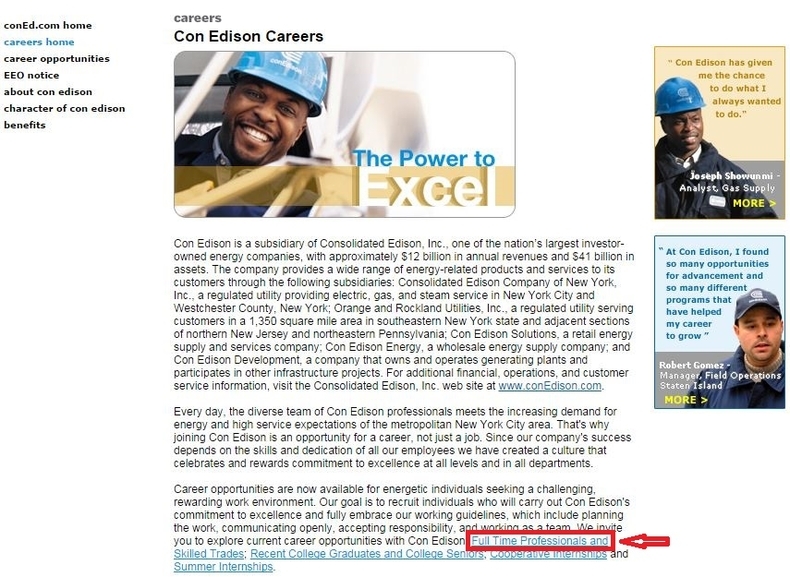 Click coned.com/careers to apply for Con Edison jobs online.